As one of the fastest growing charter networks in Pittsburgh, Propel Schools is dedicated to transforming education in underserved communities through the use of student-centered instruction. In the fall of 2016, Propel was eager to leverage the district’s existing Chromebooks to better engage students and accelerate academic growth. Looking for a solution that tapped into the power of project-based learning, Propel provided 1,200 6th-8th grade students with access to Frontier, eSpark Learning’s web-based platform for building strong writers and readers. “We decided to implement Frontier because we wanted our students to have experiences with authentic, project-based models they could work through at their independent reading levels,” explains Jamie M. Chlystek, Director of Curriculum, Instruction, and Assessment at Propel. Before classrooms launched Frontier, 65 of Propel’s ELA teachers attended a professional development session in which they were taught how to use a project-based learning framework to support their instructional goals. With shared classroom devices, many teachers opted to use Frontier with a station rotation instructional mode. Throughout the implementation, classrooms were provided with 24/7 teacher and technical support. Frontier fosters interdisciplinary learning and asks students to creatively apply reading and writing skills to timely and engaging science and social studies topics. At the start of each Frontier project, Propel students were asked to choose from a number of complex guiding questions including How are crimes solved?, How does climate change affect polar bears?, and How are animated movies made? After selecting a project topic that interested them, students spent one to two weeks independently exploring Frontier’s curated online research. Rigorously vetted by eSpark Learning’s team of former educators, all of Frontier’s leveled content is highly engaging and aligned to state reading and writing standards. As Propel students explored these real-world resources, they responded to note taking prompts that encouraged them to think critically about the multimedia content they encountered. After completing their research, students engaged in extended and strategic thinking to create unique writing projects that synthesized and applied what they had learned. Using Google Slides and Google Docs, students consulted digital rubrics to practice Informational, Opinion, and Narrative Writing. After sharing a first draft with their classmates, Propel middle schoolers revised their writing to incorporate peer feedback before submitting their final project. Engaging middle school students can be challenging, but Propel teachers report that students are more focused and engaged in their learning since the district launched Frontier. “Our students look forward to their [projects] in Frontier. [They] look forward to the ability to choose different topics, and have improved greatly in the area of peer editing,” says Jamie Chlystek. "Our students look forward to their [projects] in Frontier. [They] look forward to the ability to choose different topics, and have improved greatly in the area of peer editing,"
In the district’s first semester of usage, Propel found that Frontier significantly contributed to academic growth. 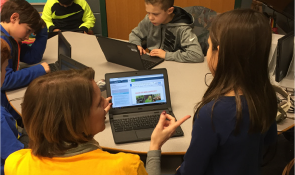 By comparing Propel’s fall and winter NWEA MAP scores, eSpark Learning’s data scientists found that students who had completed two or more Frontier projects (approximately 30 Frontier activities) exceeded their mid year growth expectations by 30%. By comparison, students who completed fewer than two projects were unable achieve their mid year growth expectations. 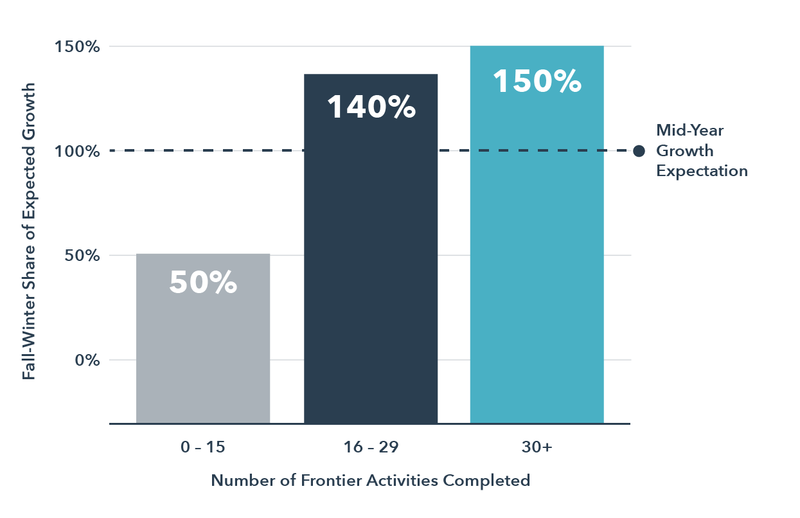 Students who failed to complete at least one Frontier project (15 or more Frontier activities) lost academic momentum over the course of the semester and demonstrated learning loss. 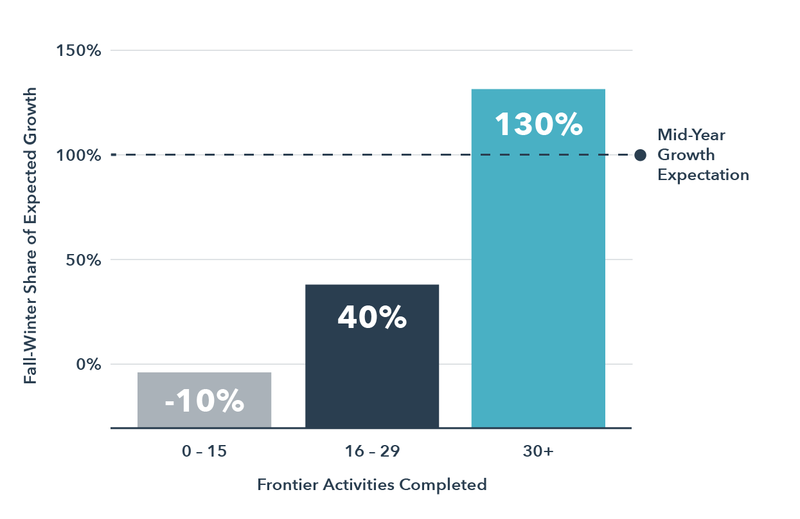 Students who had completed two or more Frontier projects (approximately 30 Frontier activities) exceeded their mid year growth expectations by 30%. Frontier’s impact was even more impressive on students performing at or below the 50th percentile on the fall NWEA MAP assessment. Students in this group who completed just one of Frontier’s writing projects achieved 140% of their mid-year growth expectations, while students who completed 2 or more Frontier projects achieved 150% of their mid-year expectations. Students performing at or below the 50th percentile on the fall NWEA MAP assessment who completed just one of Frontier’s writing projects achieved 140% of their mid-year growth expectations. "It’s amazing to see the level of commitment and pride that our students put into their [Frontier] projects, which has helped them find even more success as they transfer these skills into their other classwork." Propel has used Frontier to nurture a love of writing and reading, and the district’s commitment to authentic writing practice has supported students in exceeding academic expectations and embarking on a path to success. See how eSpark Learning can bring purposeful technology to your whole district. Teachers qualify for a free trial of our web-based product Frontier.